Oil industry employment stabilized in mid to late 2018, and increased activity on the North Slope signals resumed growth. The construction industry, hit especially hard during the recession’s first two years, began to add jobs in 2018 and will pick up the pace in 2019, mainly through projects at Eielson Air Force Base in the Interior. The three main drivers of growth will be military, oil and tourism. 2019 is expected to be another record year for tourism across the state. The projected number of cruise ship passengers is up 16 percent, to 1,361,400. 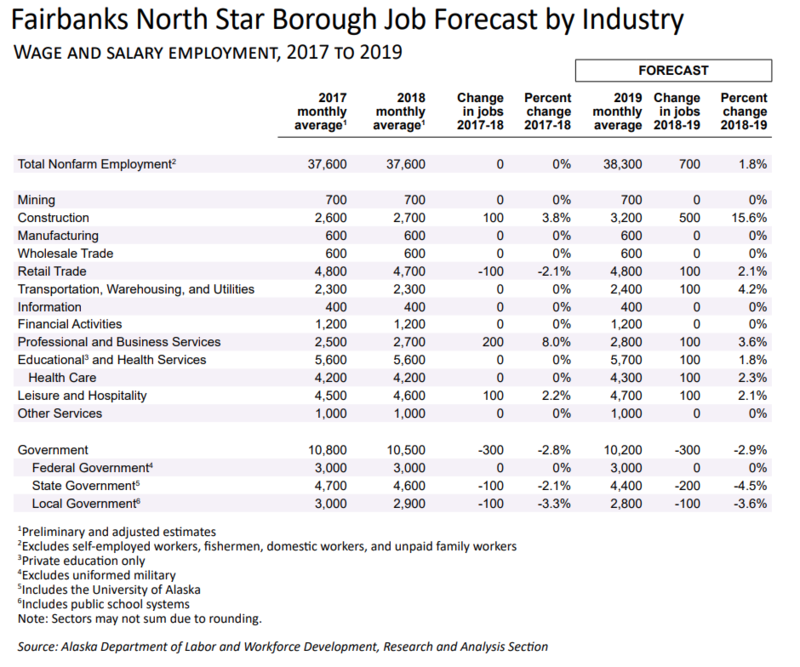 The Fairbanks North Star Borough’s employment declined in every year but one after peaking in 2012, before flattening out in 2018 as the tide began to turn. The borough’s growth is forecasted at 1.8 percent for 2019, or about 700 new jobs. Fairbanks North Star Borough has recorded three straight years of record-breaking bed tax collections, and it appears 2018 will become the fourth.